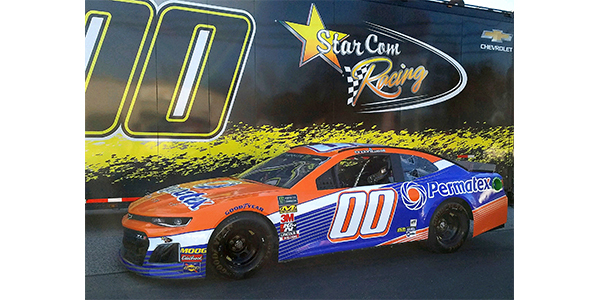 Permatex is sponsoring StarCom’s 00 Camaro and driver Landon Cassill in the Monster Energy NASCAR Cup Series’ premier event at the 2019 Daytona 500. Permatex will be returning to NASCAR competition with StarCom Racing at the 2019 Daytona 500 on Feb. 17. The sponsorship of StarCom’s 00 Camaro and driver, Landon Cassill, in the Monster Energy NASCAR Cup Series’ premier event represents Permatex’s first participation as a NASCAR team corporate sponsor in almost four decades. Permatex says it has a long and storied history in motorsports, and has supported many types of professional and amateur racing venues from circle tracks to drag strips to road circuits. Company founder, Constant A. Benoit Sr., began using his innovative sealants to prevent head gasket blowouts in endurance racecars in 1915. Bobby Allison with his Ford Galaxie 500 after completing an historic 300-mile run at Talladega with an engine assembled using only Permatex Sealants. In 1936, legendary stock car driver, Bill France Sr., boldly assembled the engine of Milt Marion’s No. 23 racer using only Permatex sealants and helped him win the first stock car race at Daytona. Marion then drove an additional 20,927 miles across the country, probably the first “Lap of America,” just to see what the Permatex gaskets could do. 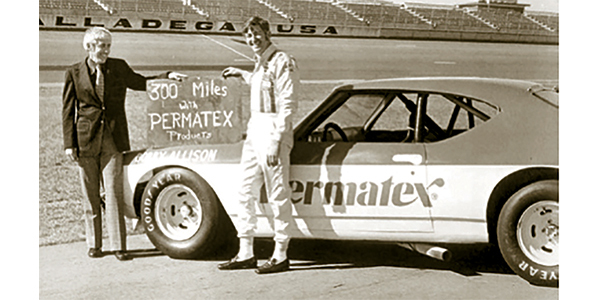 In the mid-1970s, Bobby Allison made a 300-mile endurance run at Talladega using an engine that was assembled with Permatex gasket makers and threadlockers in place of cut gaskets and lock washers.